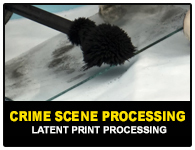 Crime Scene Processing - Latent Print Processing will be a test based on CSI field collection processes and techniques. The test will consist of a varying number of non-porous items which a CSI may be required to process at a crime scene. At this time ANAB has approved the RS&A Latent Print Processing Proficiency Test to be used as a true Crime Scene PT. 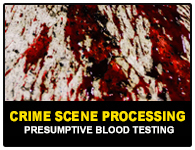 This test will satisfy any Crime Scene Unit accreditation requirements set forth by ANAB. MOVING FORWARD…we are excited to tell you that RS&A is actively working to add the discipline of Crime Scene to our ISO/IEC 17043 accreditation scope. Future RS&A Crime Scene PT’s are currently under development. 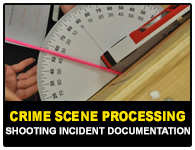 The overall plan for the Crime Scene PT is to cycle through various testing methods such as processing, presumptive blood, shooting reconstruction, and others other like tests that will evaluate a Crime Scene Investigator’s ability to process a crime scene. © 2002 , Ron mit & Associates, Inc.